Women on a Mission: Mom Edition: WEARABLE WEDNESDAY: PART TWO: Purple Jacket! So now I have to make something wearable out of it. As I said in Part One, I knew what I was going to do with the pink strappies and buttons – what I meant was – get rid of them! Naturally cutting out those redic shoulder pads was a must, and the next step. I figured I’d be going shirt/jacket with this, so I began by seam-ripping up the center seam of the dress. It was serged so there were a lot of threads to take out, and I had to watch the girls like a hawk so they wouldn’t run off with them. But who did I really have to watch? Theodore! Stupid cat tried to eat some thread. With the center ripped up, I folded down the neckline lapels and made myself some new seams of the center pieces. It took a few tries since my bobbin got messed up on the first try. Easy Mac displaying the seam-ripped center. KD is Little Red Riding Hood in the background. KD kept taking out the pins behind me - grrr! Lastly, I needed to sew a new hem on the bottom of the jacket. I stood in front of a mirror and decided where on me I wanted the jacket to fall, and I pinned accordingly. I decided to sew the new bottom seam up 2 inches from the bottom so the stitching line would blend in a little better. I messed around with the idea of adding a button to the top to hold it together, but I think putting a hook and eye on it will be best. Need to get one. I’m also feeling like it could use a flower embellishment, so I’ll report in if I find or make the perfect thing. AFTER: for now--I will post a picture when I wear it! Paired with slacks and a tank top underneath, I’ve got a great jacket for work (in the summer, not yet, seeing as it’s still cold here – we saw a few flakes of snow this morning – are you kidding me?!?). Honestly, I’m on a purple kick right now (don’t worry, I haven’t forsaken my beloved pink) – could be because my girls’ new fave movie is Tangled and Rapunzel wears purple. 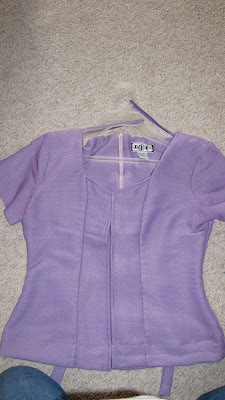 I’m glad to have a THRIFTY new purple piece for my wardrobe. I just came across your blog via NDAD and really like your pink to purple jacket redo! Between you and Marisa, I am now going thru my closet to find redo-ables. I am on the plus-size but losing, so I don't want to spend a lot of money on new clothes. Jules - keep following our blog - we like to do these re-styles, so hopefully you'll have more inspiration. If you have any questions, feel free to email us!